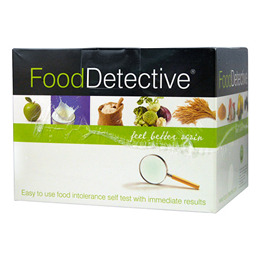 Food Detective - The easy to use food intolerance self test with immediate results. Bloated after eating certain foods? Tired at certain times of the day? Could you be suffering from food intolerance? Find out, test yourself today! Introducing the most convenient Food Intolerance test in the UK. Simple, safe, accurate and fast, Food Detective is the world`s first self test for food intolerance. Food Detective is a single-use rapid test capable of detecting food specific IgG antibodies to 59 common food types. This test identifies foods causing IgG antibody production which may be involved in various conditions such as food intolerance, irritable bowel syndrome, eczema and arthritis. Once identified, the trigger foods may be eliminated from your diet. This test does not identify classical IgE mediated food allergies. Everything required to carry out the test is included in the kit, including detailed instructions and an informative dietary support guide. Cereals - Corn, Durum Wheat, Gluten, Oats, Rice, Rye, Wheat. Nuts & Beans - Almond, Brazil Nut, Cashew, Cocoa Bean, Peanut, Legume Mix (pea, lentil, haricot), Soya Bean, Walnut. Meats - Beef, Chicken, Lamb, Pork. Fish - Freshwater Fish Mix (salmon, trout), Shellfish Mix (shrimp, prawn, crab, lobster, mussel), Tuna, White Fish Mix (haddock, cod, plaice). Vegetables - Broccoli, Cabbage, Carrot, Celery, Cucumber, Leek, Peppers (red, green, yellow), Potato. Fruits - Apple, Blackcurrant, Grapefruit, Melon Mix (cantaloupe, water melon), Olive, Orange & Lemon, Strawberry, Tomato. Other - Egg (whole), Cow`s Milk, Garlic, Ginger, Mushroom, Tea, Yeast. Food intolerance is not usually life-threatening, but it can make the sufferer feel extremely unwell. The symptoms of food intolerance can be delayed for many hours or even days, and for this reason it is often difficult to identify the problem foods. Food intolerance may produce a variety of symptoms such as bloating after eating, poor skin health or an upset digestive system. * Changes to diet should only be made after consultation with a qualified nutritionist. This product can only be sold in the UK. The Reaction Tray is sealed in a foil pouch with desiccant to maintain stability. All solutions are supplied in inert PET bottles. Developer Solution is supplied in black PET bottles to prevent photolysis. All bottles are capped with machine tightened caps to prevent oxidation, leakage etc. Secondary packaging comprises of a robust cardboard insert to hold the kit components in position and a strong cardboard box which is sealed in Saran wrap to maintain the integrity of the kit. Simply take a small blood sample from a finger-prick, dilute it and add it to the Food Detective testing tray (which contains small spots of food protein extracts). Then use the detector and developer solutions to identify the presence of food antibodies through the appearance of one or more blue spots on the tray. Refer to the food layout plan, enclosed with the instructions, to identify which foods you may have an intolerance to. This product can be used from the age of 2. *Full and detailed instructions are included in the test kit. Accurate results depend on the procedure being carried out according to the instructions. Food Detective results do not indicate any specific medical condition. If you are worried about a particular food or suffer from a classical IgE medinated food allergy e.g. peanut, but it has not given a positive result in this test, we advise you to continue to avoid such foods. Significant changes in diet should only be made after consultation with a qualified nutritionist. Do not use this test if you suffer from blood clotting disease. If blood comes into contact with any surfaces, wipe them with disinfectant. Keep all materials in a cool dry place and out of the reach of children. Do not touch the inside surface of the reaction tray and do not expose the reaction tray to moisture or dust. None of the solutions included in this test are toxic according to European Directives. However, handle all components with care. Avoid ingestion, inhalation and contact with skin and eyes. In the event of skin contact, wash the skin with plenty of soap and warm water. If swallowed, seek immediate medical advice. Dispose of test solutions into sink. Ensure that the cold water is running to flush away and dilute the chemicals. At the end of the test flush the sink with household disinfectant. After use place the reaction tray, lancets and sample bottle containing the glass tube in the plastic bag provided and dispose of it in household waste. This test is not intended to replace medical advice; it does not diagnose allergies; it is a qualitative test and the results are a guide to diet only. If you have a medical condition, are pregnant or taking medications it is advisable to discuss any proposed changes to your diet with your GP or other health professional. If you test positive to any of the food groups in the test, the simple act of removing them from your diet* can completely change your life. Advice on alternative foods and removal of foods from your diet can be found on our website. Below are reviews of Food Detective Food Intolerance Test Kit by bodykind customers. If you have tried this product we'd love to hear what you think so please leave a review. This was for a repeat test 18 months after addressing the results of my first result. Following the instructions the test is relatively simple to do and guidance on interpretation excellent. I confirmed the results of the being diligent in excluding wheat and dairy as sensitivity completely lost and symptoms went too. Still reacting to eggs, but then I have been less diligent excluding them! Excellent value, health improved soon after I changed my diet, and this test is an easy way around the routine of trial and error exclusions, so I will revisit this test again next year. Best £65 I have spent in a long time. The instructions were easy to follow and it worked really well. The result showed a strong reaction to yeast which I have now eliminated from my diet. The symptoms I have endured for years are getting better at last. Easy to order and very quick delivery. Very clear instructions, easy to follow and it worked fine. Thankfully it confirmed the mild reaction to wheat as I suspected. The booklet is a great help too. This has saved me a lot of time and money, as I could not get an appointment with anyone for weeks! Easy to use but didn't work very well- were lots of indicators that looked slightly blue but couldn't tell if it was enough to represent an intolerance or not. Very easy instructions to follow and I feel so much better knowing what was causing the problem and eliminating it from my diet - and so much quicker that doing an elimination diet! The booklet that comes with the kit further explains what to look for on food packaging and has been a great help. Absolutely superb test. Easy and totally painless to use and the best and quickest way to find out what causes your food intolerance. Helped me a lot to cut out the foods that can cause me serious skin problems. This test was an eye opener. I had a feeling I was Intolerent to Cows Milk but to learn I was also intolerent to Whole Eggs was a surprise. I have eliminated both of these products and my unsociable issues have all gone. This was the best way to get the results and I will never regret purchasing this Home test. Thank you. You can waste £60 on groceries trying and eliminating different foods or you could take this test instead. It confirmed what I thought but also a few other foods as well. If you have a low pain threshold the lancet is so quick its not painful. The instructions says to prick your thumb or finger. I'd recommend your ring or pinky finger. I first tried my thumb but found it hard to get a drop of blood, probably because the thumb is more flat. I then tried my ring finger and had no problem getting blood. Easy and painless way to find out what you're intolerant to. Cashews and whole egg were my biggest ones. I've cut them out and I've definitely noticed a difference. I highly recommend this test! 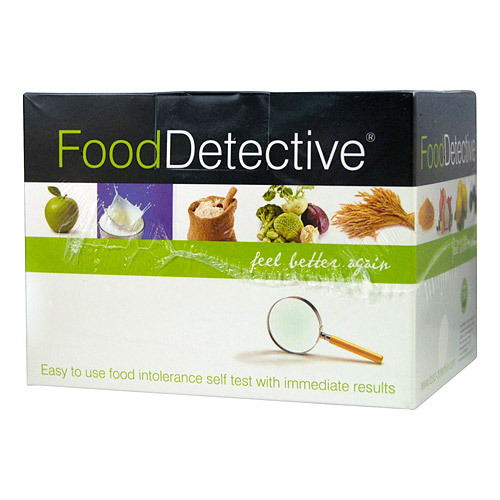 Food Detective introduce the most convenient Food Intolerance test in the UK. Simple, safe, accurate and fast, Food Detective is the world’s first self-test for food intolerance.